I am from Des Moines IA, Currently, a second-year grad student studying post-secondary education students affairs. Some of the things I'm involved on campus currently is that I do academic advising with Student Support Services and helping with Kathy Peters with her freshman strategies course. After graduation this May I am hopeful to work at a university possibly doing so form of advising, but would love to work with students who come from underrepresented multicultural backgrounds. I am a Graduate student studying Postsecondary Education: Student Affairs and am originally from Des Moines, Iowa. My BA is in Communication Sciences and Spanish which I completed at University of Northern Iowa. As an undergraduate I was involved in many student organizations including Greek Life, Spanish National Honors Society, Refugee and Immigrant Support & Empowerment, and served as Vice President of Risk Management on the Panhellenic Council. Furthermore, I spent a semester abroad in Oviedo, Spain which solidified my passion for international and multicultural education. I love hearing personal stories and perspectives from individuals with backgrounds different than my own and find great value in empowering underrepresented communities. In addition to my assistantship, I am also a Global Panther Success Coordinator for the International Students and Scholars Office and serve as the co-advisor for International Student Promoters. In my free time I enjoy traveling, exercising, and participating in water sports such as skiing and wake boarding. Hi, I am Beto! I am a Junior studying Marketing management from Des Moines, IA, I am the President of UNIdos which is the Latinx organization on campus. I am a brother of Lambda Theta Phi Latin Fraternity Inc. During my time at UNI I have also been an Orientation Leader and Jump Start Pathfinder. I plan to graduate in may of 2020 and then pursue a Master's Degree. My name is Ami and I am a junior here at UNI. I am the Marketing and Public Relations Student Programming Coordinator for the CME. I am a Management major with an Organizational Leadership emphasis. I am also minoring in Entrepreneurship. I plan to open my own business in the future after I graduate. I want to open a restaurant in Iowa City and eventually expand to other locations. I was born in New York and raised in Iowa City. In my free time I enjoy eating, socializing, and running. My name is Cierra Robinson and I am from Des Moines, Iowa. I’m a junior studying Family Services, minoring in French and Mental Health. 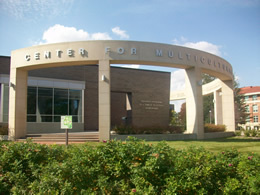 I will be working at the Center for Multicultural Education as a Student Program Coordinator. I am involved on campus as Black Student Union’s president, an ambassador for Ethnic Student Promoters, a representative of A.C.T.I.O.N (Advocates Courageously Training Individuals on Unity), and a Program Assistant for UMETT (UNI Minority Educators of Today & Tomorrow). As a student leader, my objective is to empower and guide my peers, as well as incoming prospective students, by creating transformational environments for student leadership learning and growth. My interests include, mental health and advocacy. My name is Fourtytwo Yet. I was born in a small village called Waat in Southern Sudan. I was born around 1993. I am a student at the University of Northern Iowa. I am majoring in international social work, refugee’s relief. When the civil war broke out in Southern Sudan I fled to Kenya as a refugee. Due to the civil war I was separated from my parents when I was only seven years old. I have not seen my mother in 22 years. My father was killed during that war. I have six brothers and five sisters. I lived in Dadaab refugee camp in Kenya for more than fifteen years. My hobbies are playing soccer, watching soccer, swimming, and running. I have big dreams that I need to achieve. My goal is to finish my bachelor degree and then master degree and possibly my PhD. My name is Jason Huang and I am a sophomore accounting major at UNI. I will be working at the Center for Multicultural Education as a student program coordinator. While at UNI, I am involved in student organizations such as Accounting Club, Sigma Alpha Pi, and Northern Iowa Wishmakers. In addition, I try to give back to the community by volunteering for Habitat for Humanity and Northeast Iowa Food Bank. I will also be a Multicultural Mentor for first-year students this year. As a mentor, I hope to ease the transition of students of many different ethnic backgrounds during their first year at college. During my time at the CME, I hope to educate students at UNI about diversity and provide a new perspective about the different types of cultures. After college, I hope to obtain my CPA license and pursue a career in public or private accounting. My name is Kyla Ford I am a senior studying Social Work and Criminology at the University of Northern Iowa and plans to graduate in the Spring of 2019. I am involved on campus as a Student Representative for the Student Social Work Association, a Community Outreach volunteer with Ethnic Student Promoters, a McNair Scholar, the Director of Programming for Active Minds, and the Active Minds Representative on the Suicide Awareness and Prevention Counsel. My interests include social justice research, education, and advocacy. Hello, my name is Zainab and I am Sophomore here at the University of Northern Iowa. I am majoring in athletic training and minoring in sociology. I am from Fort Dodge, Iowa. My hobbies are going on coffee runs and going on nature walks. I am involved in PT club, BSU, and ESP.